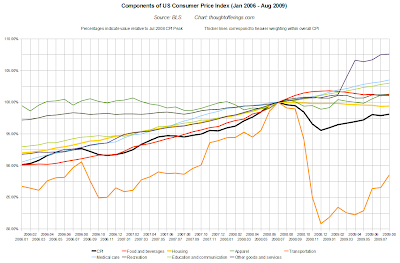 "On a seasonally adjusted basis, the Consumer Price Index for all Urban Consumers (CPI-U) rose 0.4 percent in August, the Bureau of Labor Statistics reported today. 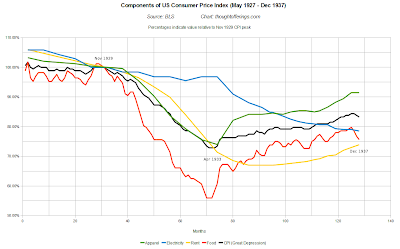 The index has decreased 1.5 percent over the last 12 months on a not seasonally adjusted basis. 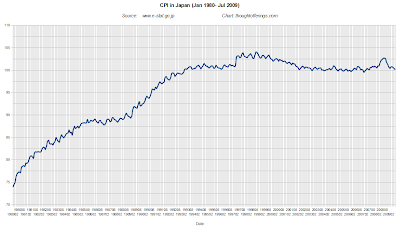 The 0.4 percent seasonally adjusted increase in the CPI-U was driven by a 9.1 percent rise in the gasoline index. 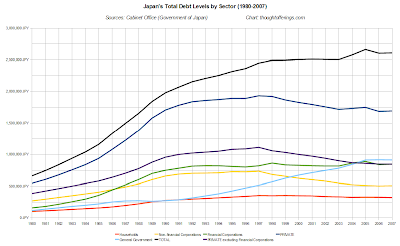 This increase accounted for almost the entire advance in the energy index and over 80 percent of the overall increase. 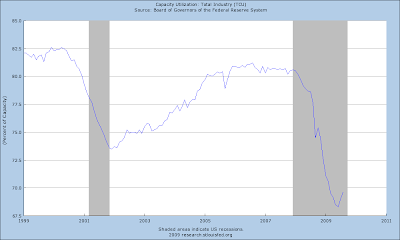 Despite the August increase, the gasoline index has fallen 30.0 percent over the last 12 months. 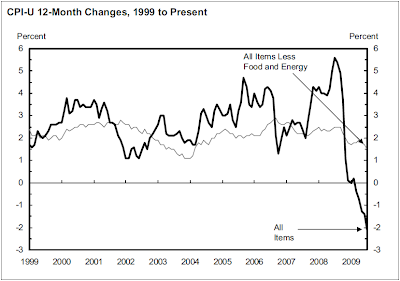 The indexes for food and for all items less food and energy both posted slight increases in August. The food index rose 0.1 percent following a 0.3 percent decline in July. 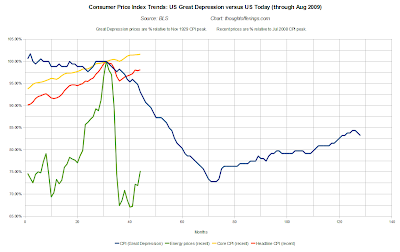 The food at home index, which fell 0.5 percent in July, was unchanged in August. Of the six major grocery store food group indexes, three rose in August and three declined. 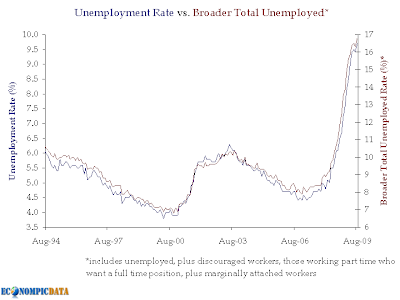 The index for all items less food and energy also rose 0.1 percent in August, the second consecutive such increase. 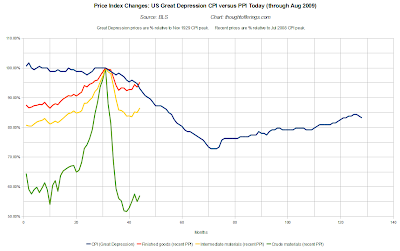 Increases in the indexes for used cars and trucks, medical care, public transportation and lodging away from home offset a decline in the new vehicle index. The index for all items less food and energy increased 1.4 percent over the last 12 months, the smallest 12-month increase in the index since February 2004." 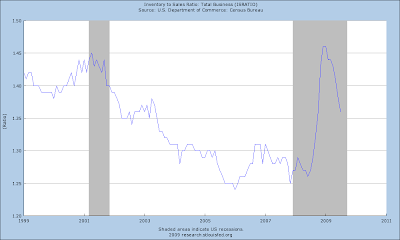 "The BLS measure for rent increased slightly (rounded to flat). And owners' equivalent rent (OER), the largest component of CPI, increased slightly even though rents have been falling in most areas." 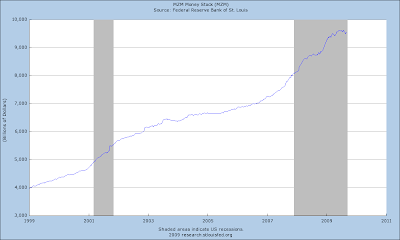 This is a partial selection of measurable forces that contribute toward price deflation, though the core cause is the bursting of debt-financed asset price bubbles. 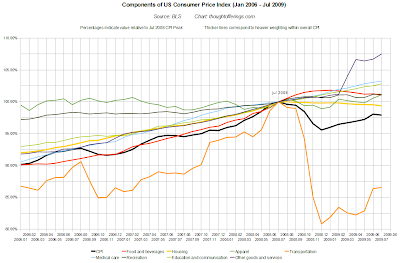 Not all of these measures are in an outright deflationary trend, but most are suggesting at least disinflation. 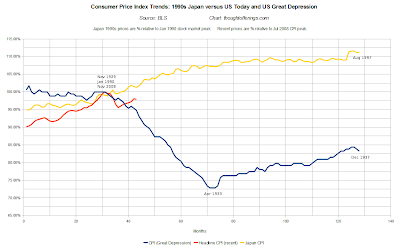 This data is US-specific, but US price levels will also be affected by global trends in the months and years ahead, for example with respect to whether China and other emerging economies falter meaningfully in their growth. 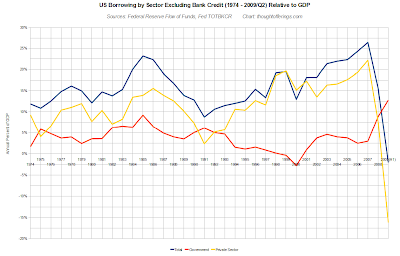 The rate of private sector deleveraging (yellow line) is still increasing as of Q2. 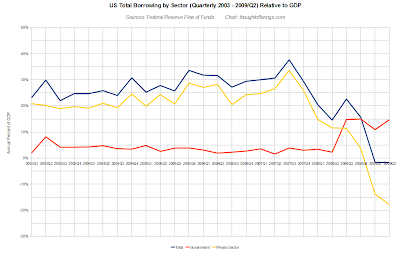 The rate of government borrowing (red line) has been mostly flat since Q3 2008, with a dip in Q1 2009. 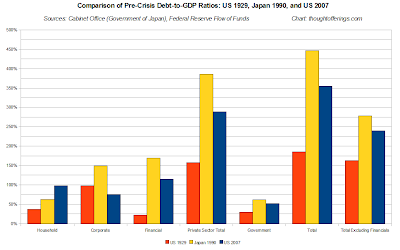 If these two trends continue, total borrowing may begin to contract more significantly, with potentially more noticeable macroeconomic impacts (for example, deflation). 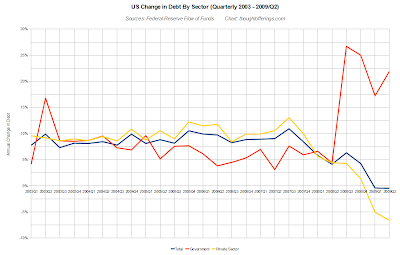 This chart shows the quarterly change in debt for each sector, i.e., borrowing relative to existing debt for that sector rather than relative to GDP. 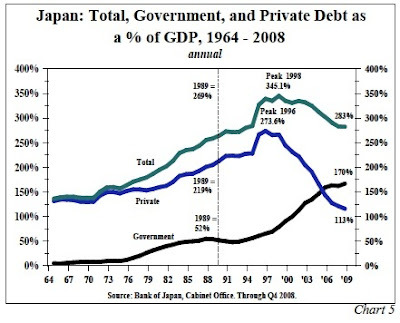 Since government debt is much smaller than private debt, it clearly is growing at a much larger rate in these terms. 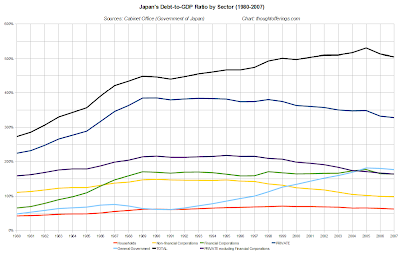 Also of note is that the private sector is deleveraging at a 6.6% annualized rate, which leaves a lot of room for further private sector debt reduction. 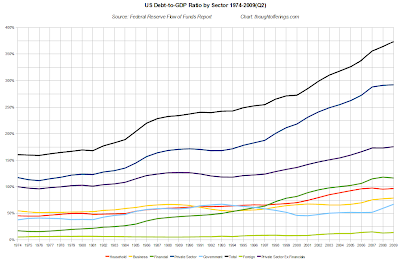 This chart shows the same data on a longer time-line — annual data since 1974. 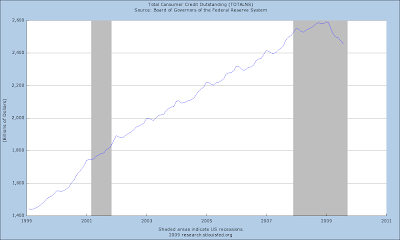 This chart again shows the longer term borrowing trend but with changes in bank credit (TOTBKCR) subtracted from total borrowing and private sector borrowing. 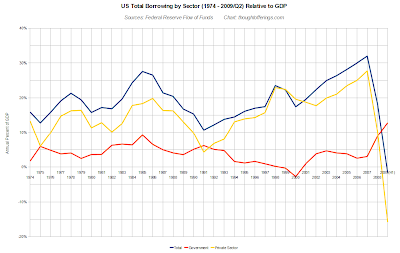 In other words, it captures the borrowing enabled by non-bank lending (such as bond issuance). While the data isn't very useful for most of the years shown (since expanding bank lending increases the money supply and amplifies the non-bank lending that can occur), the point of this chart is to show that the recent contraction in total borrowing is not about contraction in bank loans alone. 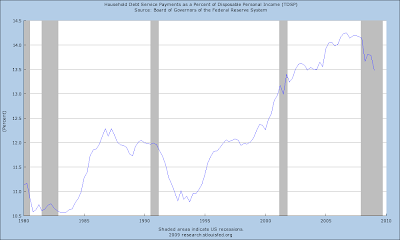 "Debt of the domestic nonfinancial sectors is estimated to have expanded at a seasonally adjusted annual rate of 5 percent in the second quarter of 2009, about ¾ percentage point faster than in the previous quarter. 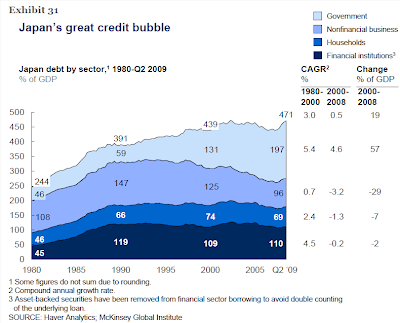 Private debt contracted in the second quarter while government debt expanded." Most people have seen Doug Short's charts comparing stock price trends during this bear market with past episodes. 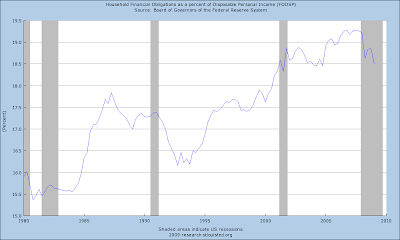 However, I haven't seen the same comparison done for dividends and earnings and was curious to see the result. 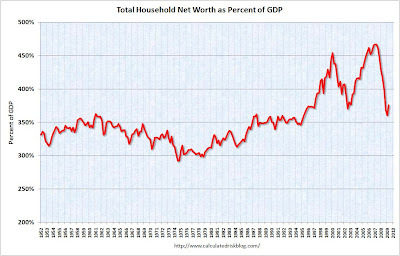 I put the following charts together primarily with Robert Shiller's stock market data, though I added in the operating earnings data for recent years from the official Standard & Poors S&P500 earnings spreadsheet. Stock prices use only a single data point for each month so these charts may differ a little from those that use daily stock price data. 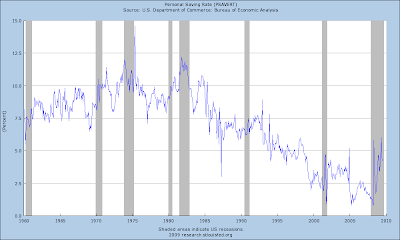 It is remarkable how closely the decline in prices tracks to the decline in earnings! 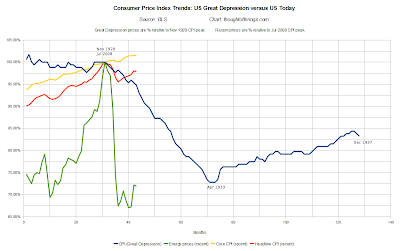 However, the chart is a little visually deceptive since the lower the values are on the chart, the larger the percentage difference between the lines at that point, e.g., the gap in blue (price) and yellow (earnings) lines in mid 1932 is larger on a relative basis than gaps higher on the chart. 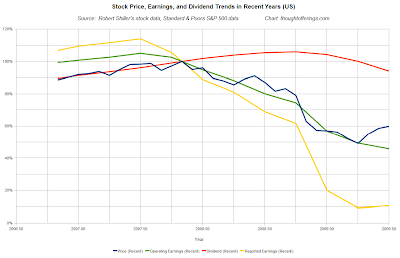 Also of note is how the decline in dividends lags the decline in earnings, with dividends ultimately bottoming out 55% below their peak value versus a larger 75% fall in earnings. 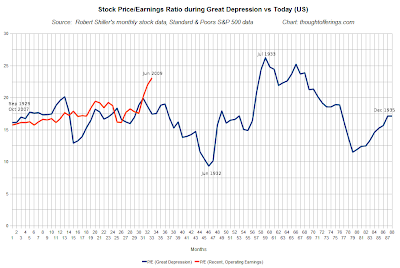 Just like during the Great Depression, it is remarkable how closely stock prices track to earnings! However, they have tracked operating earnings and seemingly completely ignored reported earnings. It appears that the push by Wall Street to focus on operating earnings (which exclude many supposedly "one time" charges, write-downs, etc) over reported earnings has been quite successful with respect to investor behavior. The gap between operating and reported earnings has grown significantly over the years so operating earnings are controversial. Reduction in dividends again lags reductions in earnings. 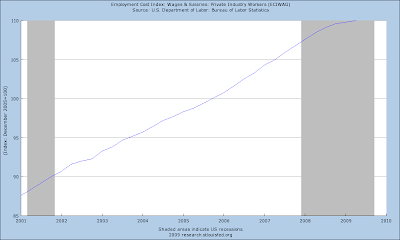 As of Q2 2009, stock prices have jumped above the earnings trend "track" by the largest amount yet. Interestingly this occurred when reported earnings rose slightly even while operating earnings declined, so perhaps the market simply chooses the most optimistic of the two! 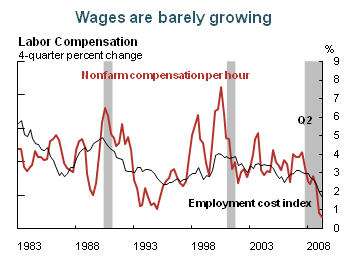 Of course the changes this spring in accounting rules (with less mark to market) may have made quite a difference in earnings in 2009 and I'm not sure whether anything comparable happened during the Great Depression. 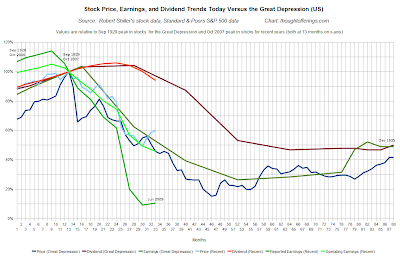 While Doug Short's charts have already shown the similar stock price trend now compared to the Great Depression, the recent trend in dividends and earnings is amazing similar to the Great Depression trend as well! (At least if one compares operating earnings today with reported earnings back then, since operating earnings did not yet exist). 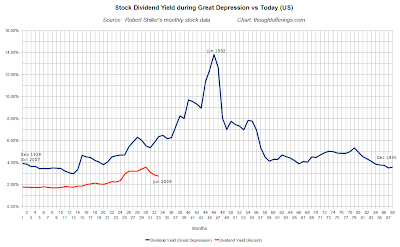 While anything could happen in future months, the current trajectory of dividends (down 11% from peak) is looking slightly steeper than the Great Depression decline. 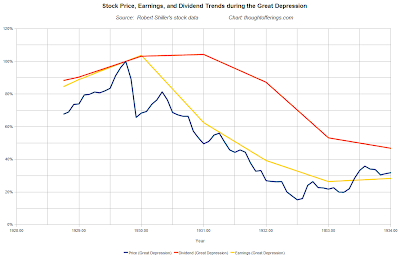 Since reported earnings have fallen so severely even relative to the Great Depression, and reported earnings are a closer representation of actual cash flow than operating earnings, the downward pressure on dividends seems like it should be much greater than during the Great Depression — unless reported earnings can stage a miraculous recovery. Is there a reason I'm not aware of why this conclusion is wrong? If correct, bonds may look increasingly attractive relative to stocks for income-seeking investors. 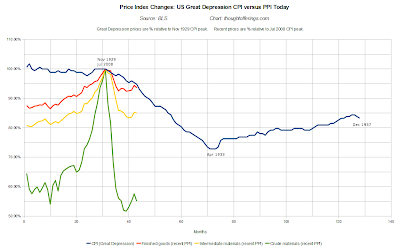 To me, the clearest value in these charts is yet one more piece of evidence that this recession/depression is very comparable to the Great Depression, despite the claims of many people that this period is "nothing like the Great Depression." And I did check the data for the years since WWII and found no other dividend declines near as large as today's, so this is not a normal recession pattern. 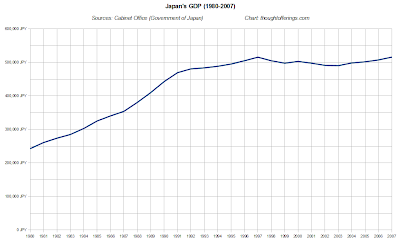 That said, these charts say nothing about the future and what will result from current government stimulus and any structural economic differences that may be relevant. 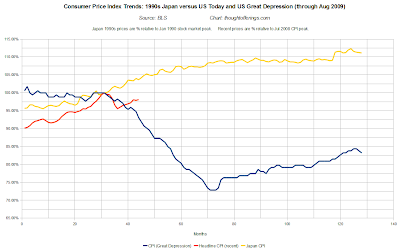 Stock prices, earnings, and dividends could immediately start heading sustainably higher and break from the Great Depression trend, or they could keep heading down. My personal view is that the downside probabilities are much higher than the upside ones (with flat being another feasible path somewhere in between), but everyone needs to make their own determinations and none of this is investment advice.